One of the advantages of brewing beer out of a complete facility like the Cold Spring Brewery is the ability to use a pilot system, and a host of expert brewers, to finely hone new beers. That’s how Cold Spring’s Third Street Brewhouse came up with its latest seasonal, an Oktoberfest done in the traditional style of the Austrian and German marzens. Brewhouse manager Karl Schmitz set his 12 brewers loose on creating the sessional beer that is being released today on tap and in eight packs of 16-ounce cans. After several test batches using the 10-gallon pilot system, the brewers “picked and chose” the best qualities and refined the recipe into the Oktoberfest found today, Schmitz said. “I think it’s one of the best beers we’ve ever done,” he said. His brewers are proud of it, so much so that they can’t wait to serve it at release parties, Schmitz said. “Marzen” is German for March, the last cool month in which brewers in Europe could make beers 200 years ago before refrigeration. They would make the last batches in the spring, cold store it in caves, and release it at its peak flavor in the fall. The result was rounder and smoother lager, thinner and crispier than the thicker ales made at the time. It just so happened that the tapping of marzen coincided with the October 1810 celebration of the marriage of the Bavarian crown prince, and Oktoberfest was begun. There are plenty of American beers being made today with Oktoberfest on their label. But the American craft boom tends to stress high-alcohol and hoppiness over the balance of a traditional Oktoberfest marzen. “The maltiness is what shines,” Schmitz said. Within that balance are hints of crackers, baked goods, he said, along with darker fruit and a hint of raisin. The marzen is full-bodied with a semi-sweet character, he said. 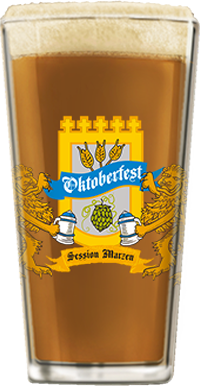 Look for Third Street Brewhouse’s Oktoberfest: Session Marzen in distinctive yellow and blue 8-pack boxes among other Third Street options at your favorite retailer. The Oktoberfest is also on tap at bars and restaurants across the state of Minnesota, as well as at the Brewhouse in Cold Spring, open on Fridays and Saturdays.